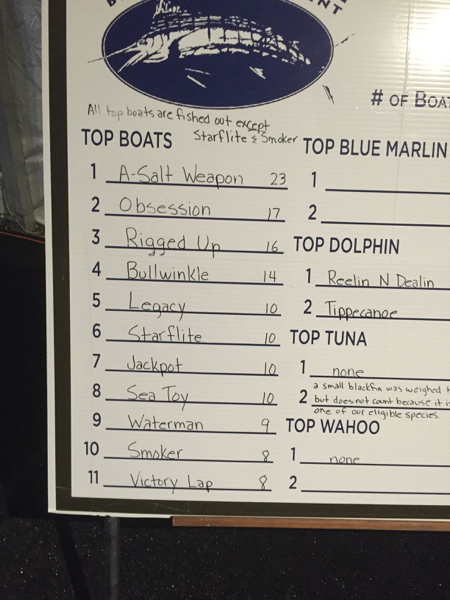 We have fished our 2 days and are done..... half the fleet is fishing today..... at the end of the first two days, we are hanging on to second place!! 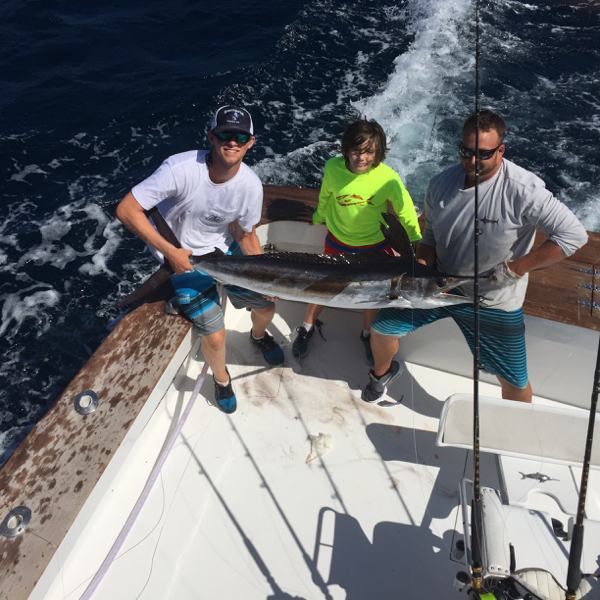 TWELVE YEAR OLD LOGAN MARLEY, FROM WINSTON SALEM, NORTH CAROLINA CAUGHT & RELEASED TWO WHITE MARLIN UNASSISTED ON LIGHT STANDUP TACKLE..... HE HAS GREAT TECHNIQUE ! 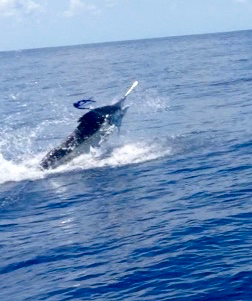 Sometimes life is unfair.....my hard working mate Joe Bonvetti had a death in the family and had to attend his grandfathers funeral..... World class mate & good friend Mikey Fulchum happened to be in town and filled in today.....we set out in 45 fathoms looking for a sail and a 250# blue marlin showed up behind a wahoo bait..... after three attempts.... HOOKED UP BLUE MARLIN....Don Carroll, from Canton Ohio hopped in the chair and a half hour later had his first blue marlin release.... a 250# fish..... soon thereafter, Kevin McCauley released a sailfish, then William Love released a white marlin to give us our first "GRAND SLAM" of the year.... then we hooked another sailfish that Kevin Love caught, and while fighting that fish, and with the teaser dangling out of the water a white marlin was trying to eat that, so Mikey hooked it and Dennis Greham caught that..... then Don Carroll caught a sailfish to end a beautiful day on the water!! 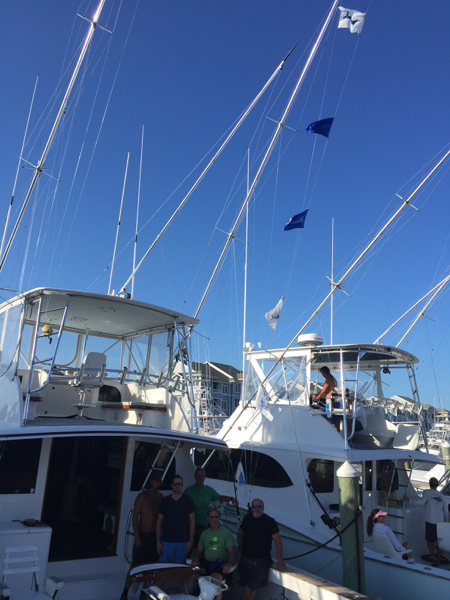 We just finished a frustrating week fishing the Pirates Cove Billfish tournament....started the first day loosing a blue marlin in the first hour and proceeded to jump off the next 9 white marlin & sailfish the first two days... took a lay day the third day... went home & beat the wife & kicked the dog and today things went better......Robert Crowder released 2 white marlin, Shani Diggs released a white marlin, Charley Townes hooked and caught a white marlin, and as our luck would have it this week, they called lines in at 3 PM when a blue marlin appeared behind the left short rigger.....hooked up Blue Marlin.... which Charley released 20 minutes later.... his first ever....a 350# fish!! 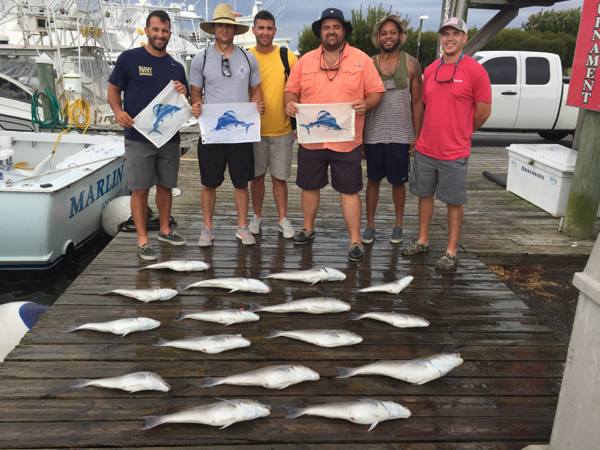 FATHER STEVEN & SON SETH MORCOM, FROM MINERAL VA EACH RELEASED WHITE MARLIN AND PHIL DENT, FROM SPOTSYLVANIA, VA & STEVE EACH RELEASED A WHITE MARLIN ALONG WITH A 25# WAHOO AND SOME TASTY TILES FOR DINNER! 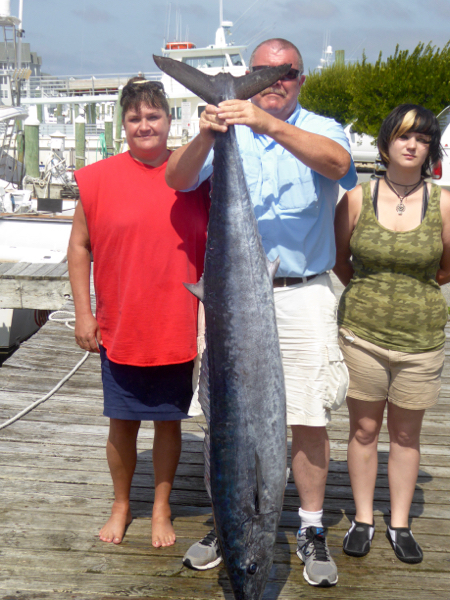 JOHNSON FAMILY ALL CATCH MARLIN! 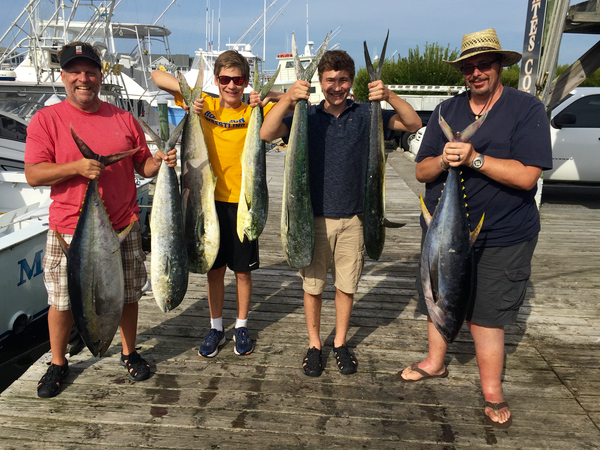 The boys took dad out to celebrate his 40th anniversary...weather was calm and beautiful and we had a great day..... Dad, John Johnson Jr, from Cranford, NJ caught and released his first blue marlin, a 200# fish on 30# line standup and a white marlin to end the day... all the sons.... Christopher, Daniel and John III also released white marlin and the family is eating wahoo for dinner! 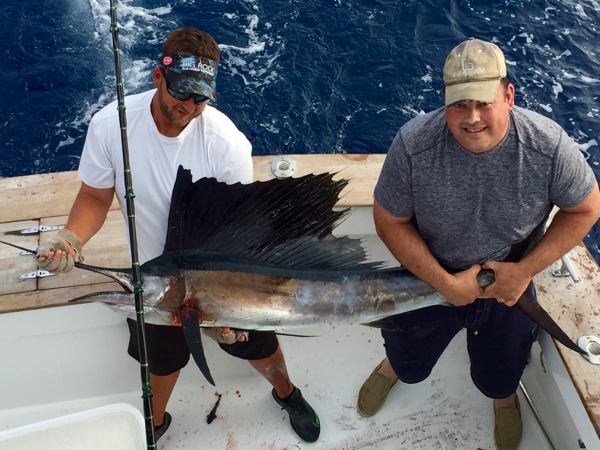 EX- NAVY SAILORS ZACHARY GALLION, FROM ARLINGTON, VA, KARL JOHNSTON FROM HAMILTON NJ & JOHNATHAN JOHNSTON, FROM ASHVILLE, NC ALL RELEASED SAILFISH ON LIGHT STANDUP TACKLE. 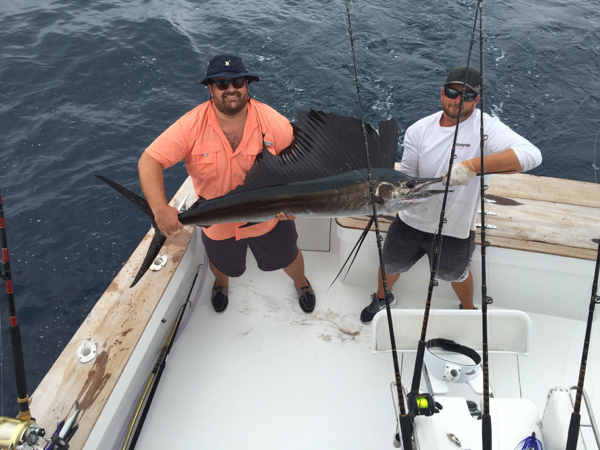 KEVIN LYNCH, FROM STANDARDSVILLE, VA RELEASED HIS FIRST SAILFISH EVER! 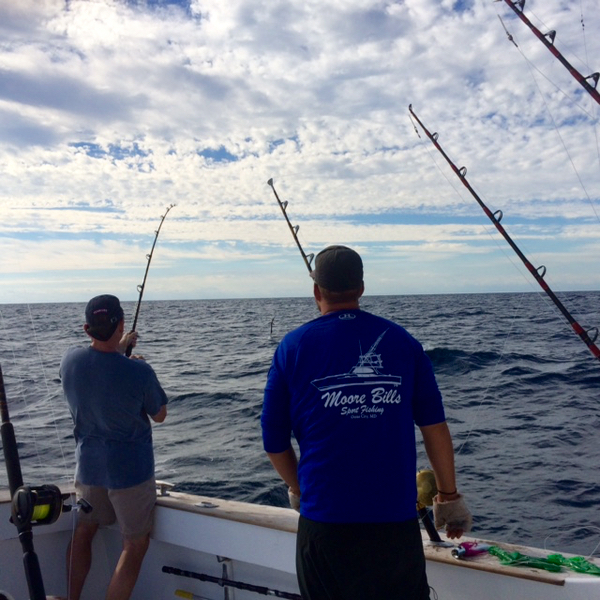 We started the day looking for yesterdays yellowfin but conditions had changed and the fish were gone! 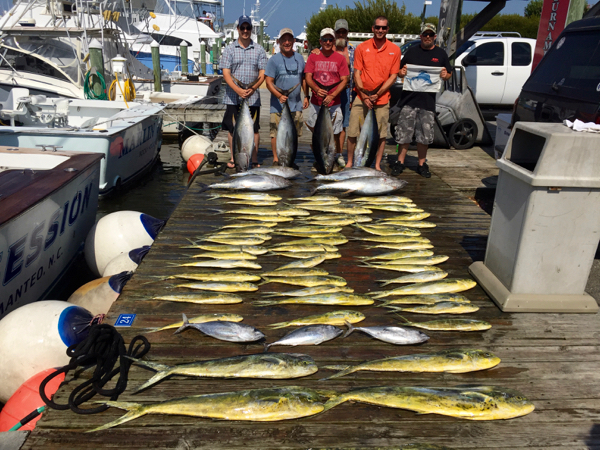 DAN CUCARULLO & CREW, FROM NORTH CAROLINA HAD GREAT LATE SEASON ACTION ON YELLOWFIN.... DAMM THINGS SHOULD BE GONE BUT WIND WAS BLOWING AND THE FISH WERE BITING.... 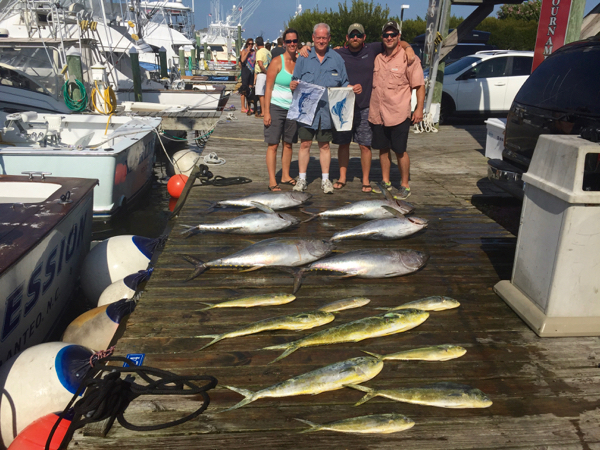 THEY FILLED THE BOX WITH 30-50# YELLOWFIN AND A FEW NICE MAHI AS WELL, ALL CAUGHT ON LIGHT STANDUP TACKLE WHILE KITE FISHING! 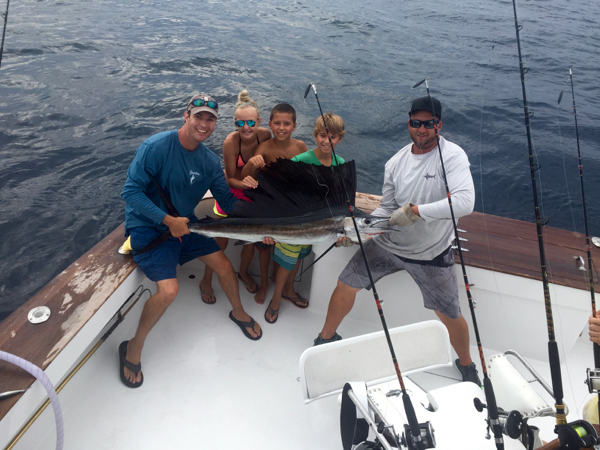 THANKS FOR THE PHOTO AND CONGRATS TO KEVIN HOWARD AND HIS 10 YEAR OLD SON AIDEN HOWARD FOR THIS PHOTO FROM THEIR DOUBLE HEADER WHITE MARLIN! 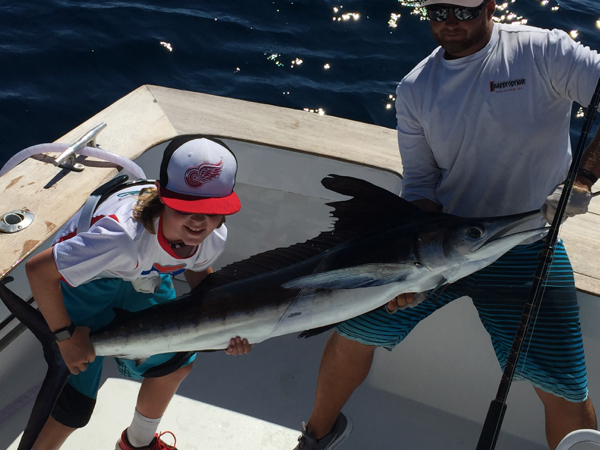 Grandfather Richard Smith, from North Carolina, took his son in law Kevin Howard and his son Aiden Howard fishing yesterday and 10 year old son Aiden fought and reeled in all by himself a white marlin which he released while Dad Kevin released a white marlin as well.... it was a father and son double header.... pretty cool! 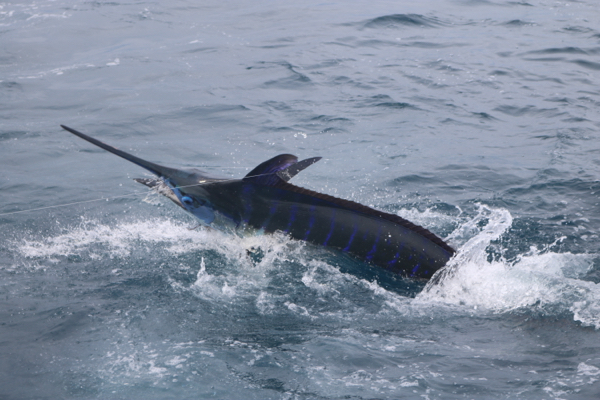 Then to end the day we had a blue marlin show up on the right side teaser, bout ripped it off the outrigger, then switch off to the left side teaser, followed it right to the boat, grabbed the dregde and then Joe got the pitch bait to him.... HOOKED UP BLUE MARLIN.... which Kevin released after 15 minuetes..... 200 lb fish! 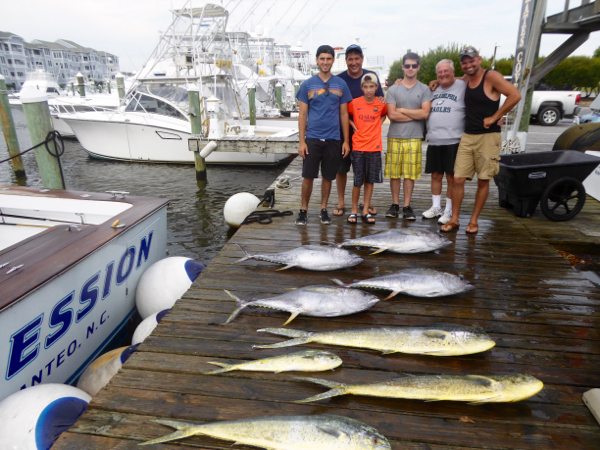 DOMINIQUE, THE OWNER/CHEF AT NAGS HEADS NEW ITALIAN TAKEOUT JOINT It's All Gravy Italian Market OBX MP 15.5 Nags Head, FISHED WITH ME TODAY WITH HIS SON, DAUGHTER, WIFE AND SISTER AND HER SON, FISHED WITH ME TODAY.....THEY BOATED FOUR 50# YELLOWFIN. IF YOU HAVE NOT EATEN AT It's All Gravy Italian Market OBX MP 15.5 Nags Head , YOU SHOULD CHECK IT OUT..... 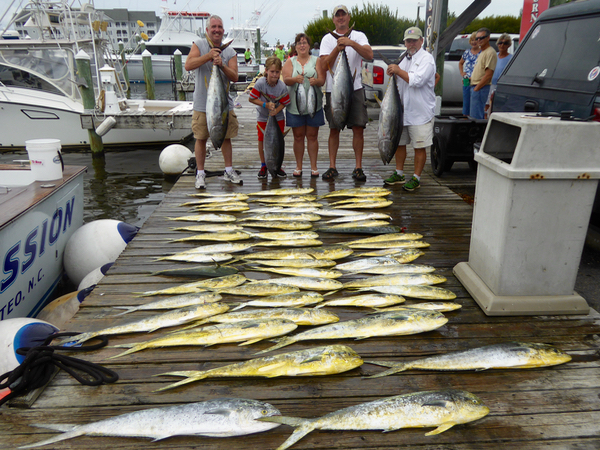 I STOP IN THERE SEVERAL TIMES A WEEK FOR SUBS FOR FISHING AND FOR DINNERS... THE MEAT LASAGNE, VEAL PICCATA, VEAL MARSALA AND MANY OTHER MADE FOR DINNER TAKEOUT ITEMS ARE FANTASTIC!!! I HIGHLY RECOMMEND IT!! 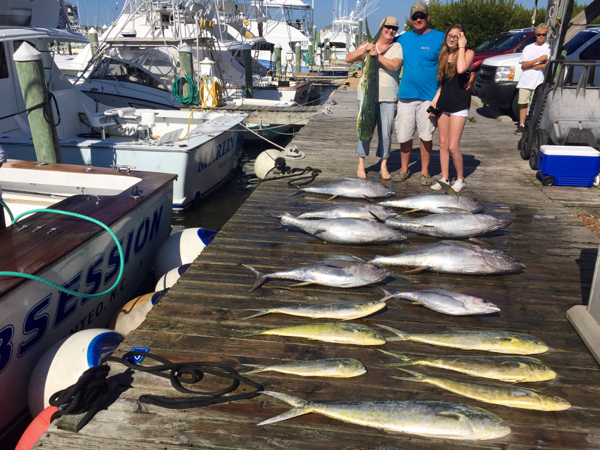 The Morges Family has fished offshore the Outer Banks for many years and on the Obsession for the last few years, but today they wrote in my guest book that it was their best fishing trip ever�.. we started the day on a grass line and caught a few dolphin�. 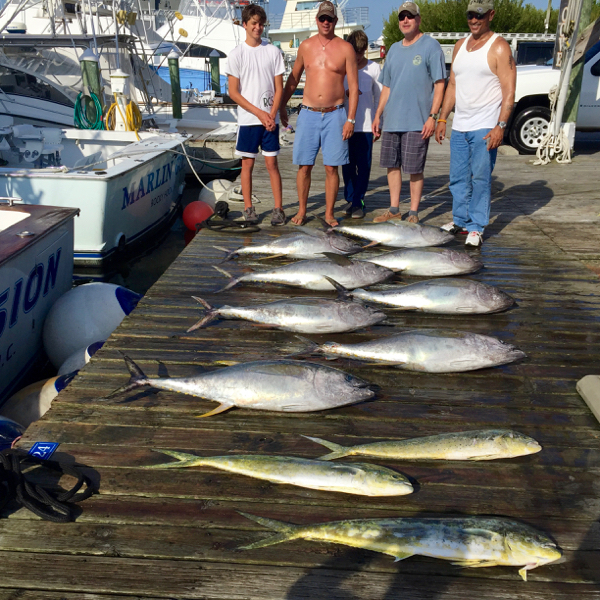 then put up the kite and everyone boated a 40-50# yellowfin�. 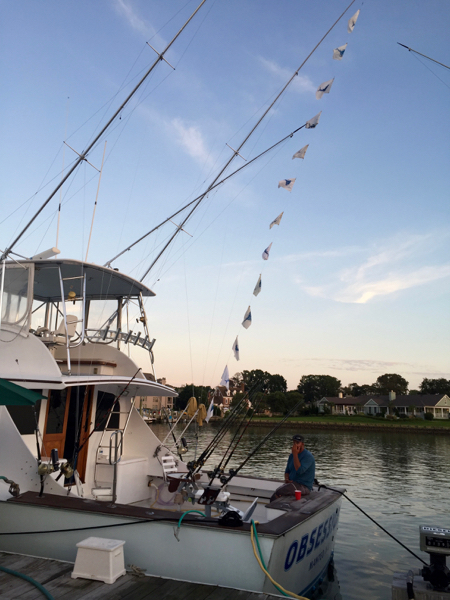 then, with the kite still in the air, we raised a blue marlin to the teaser and Joe hooked it 10 feet off the transom�. 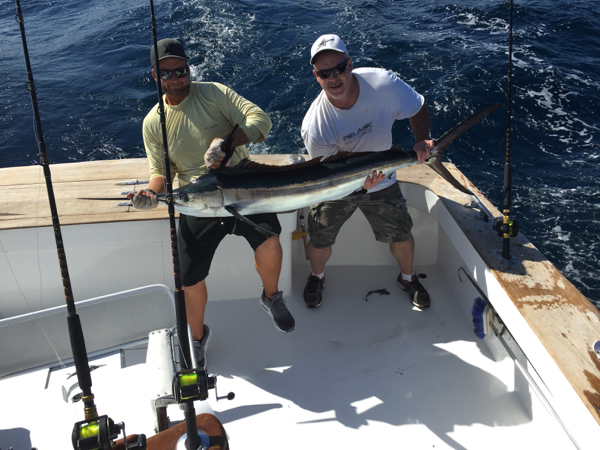 what a great inside out bite�.. HOOKED UP BLIUE MARLIN�. 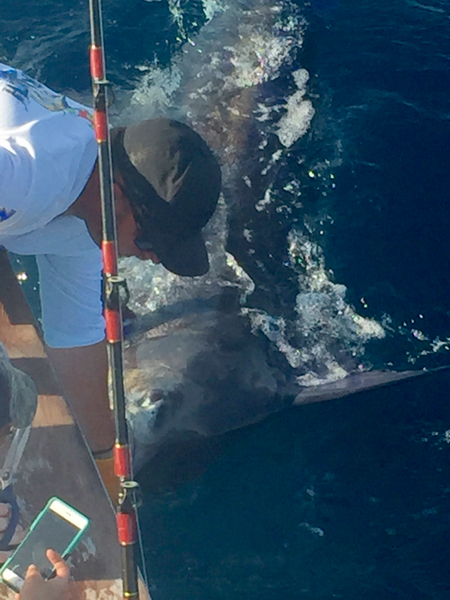 �Wayne DAD Morges hoped in the chair and after a grueling 50 minute battle got his first blue marlin release ever� a 275# fish�. 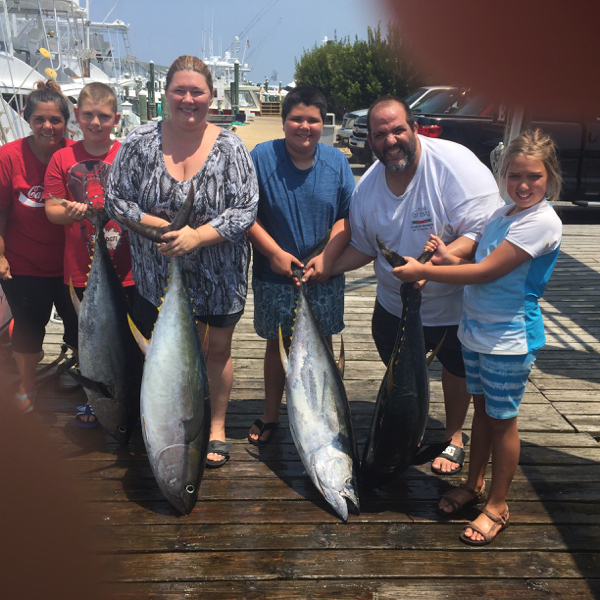 everyone was excited!!�.. 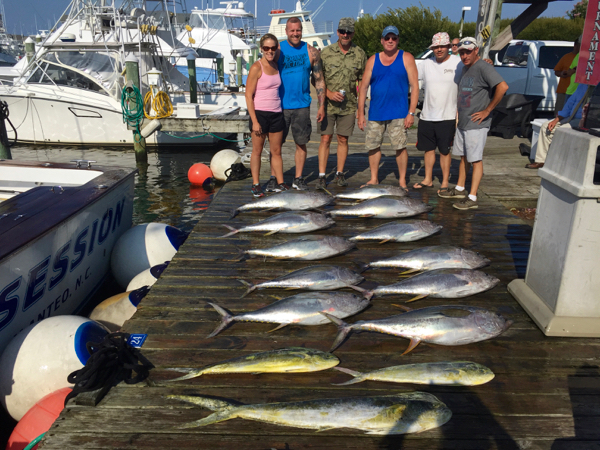 we put the trolling spread out and caught a few mahi, then raised a sailfish to a teaser which Joe hooked and Wayne caught on light standup tackle to give him his first two billfish releases and citations ever�.. great end to a perfect day!! 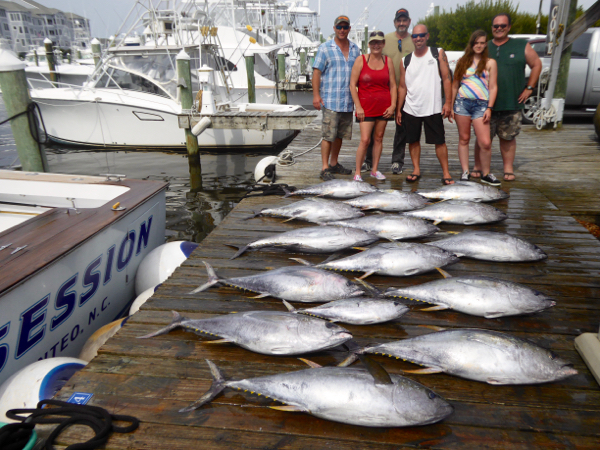 DONALD KONAN, MARK SNYDER & THEIR SONS, ALL FROM CENTERVILLE OHIO FILLED THE BOX WITH 50# TUNA CAUGHT TROLLING AND ON THE KITE.....FLYING FISH AND TUNA JUMPING EVERYWHERE IN 87 DEGREE WATER.....IN LATE JULY ......NEVER SEEN THIS BEFORE AND DON'T KNOW HOW LONG IT WILL LAST BUT IT HAS BEEN FUN!! 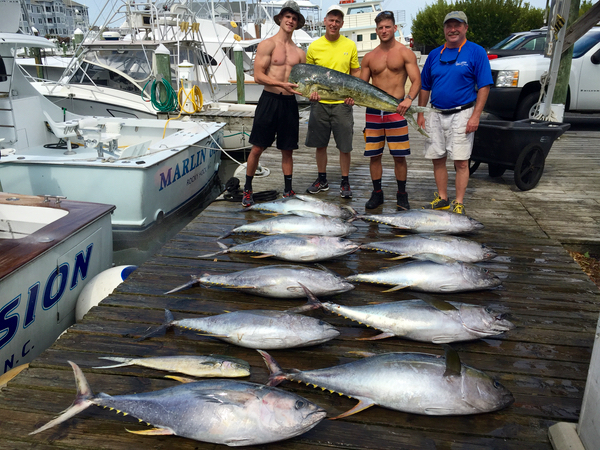 HOW LONG IS THIS TUNA FISHING GOING TO LAST! 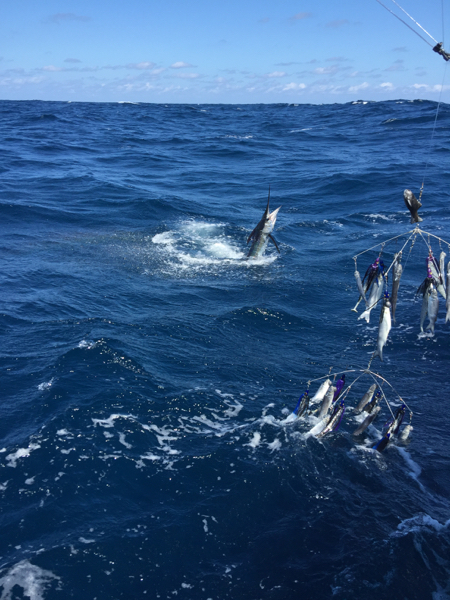 Never seen such good tuna fishing this late in July and in such HOT water..... gulf stream temps today were 85-86 deg....yet the tuna were chasing flying fish and the action was good....and the fish are BIG! 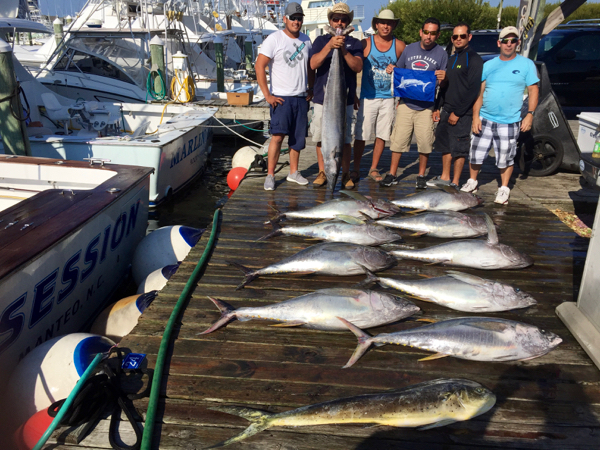 Rodrigo Castro and his crew fish with me every summer for 4 or 5 years now.... Rodrigo boated a 64# citation earning WAHOO, and Alberto Torres released a white marlin while we had the kite up, and the guys filled the box with 45-55# yellowfin, and a 15# mahi to give them a meatfish grand slam with a white marlin kicker!! 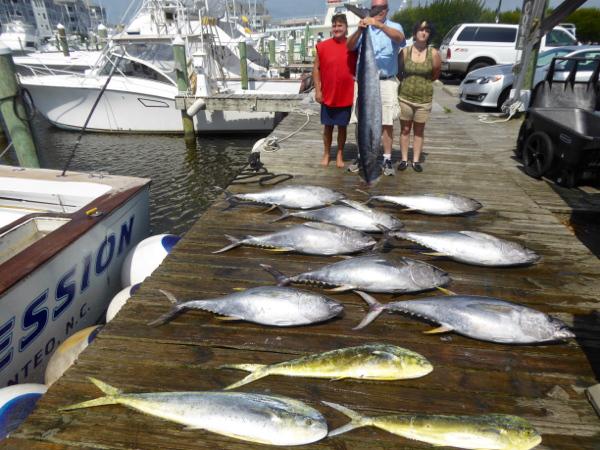 I have always told my customers if they want to catch yellowfin tuna off Oregon Inlet to fish with me April thru June ( maybe early July) and again in the fall.... but damm if we ain't had some unbelievalbe fishing these last few weeks for large (50+#) tuna, with both kites and baits, most days the tunas busting flying fish for a good part of the day, and the aggressiveness of the bites just incredible.... anyway, today every year customer Carl Fischl joined John Patka and his sons, from Cleveland, on their first offshore fishing trip and they loaded the boat with big yellowfins and a 25# squarehead! 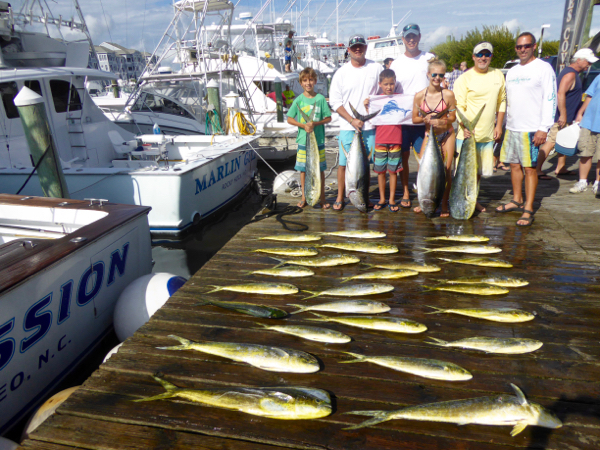 BRIAN BAILEY & WIFE & DAUGHTER HAD GOOD ACTION BOATING TUNA FROM 20 -58#, AND MAHI MAHI FROM 5-17#. 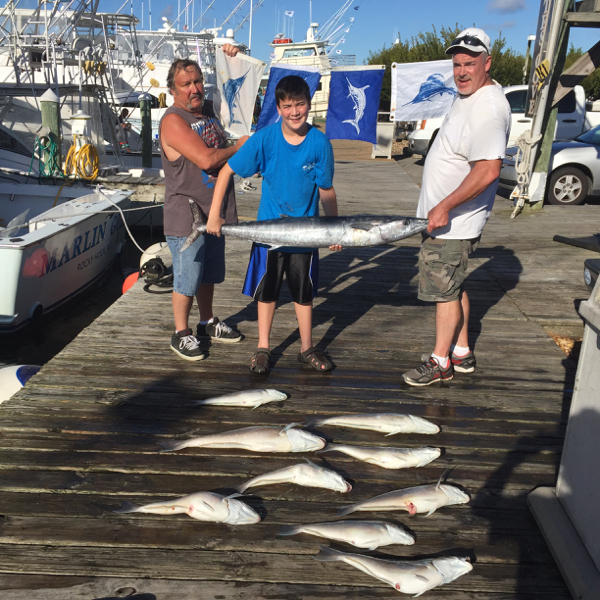 NICE WHEN THINGS GO YOUR WAY! 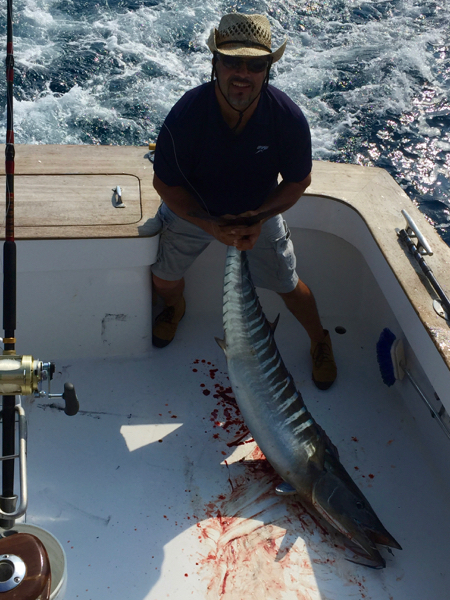 Today, for the most part things went great for us..... We hooked 3 yellowfin first thing in the morning, when fishing was otherwise slow, and then another single tuna, all 44-55# fish, then caught a wahoo on a very long bait...... 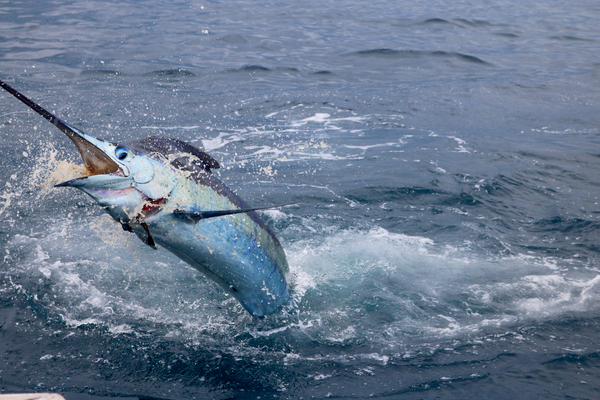 I was surprised it didn't bite us off, and its just what longtime customer and good friend Jason Christ, from NC wanted.... then we hooked a blue marlin on light tackle but while we were clearing the other 9 rigs, several of them WWFB's, the 200# marlin jumped in a big circle and cut it self off.... to ease the pain we shortly thereafter hooked 2 more 30# wahoo and caught them both..... a few more tuna in the afternoon, including one on my longest bait when I had the boat in a turn to get around some tuna on the surface and when the line come tight it cut off my teaser and my three rigger baits on that side of the boat.... that was an expensive tuna.....we caught another tuna or two, and after one of them the guys said they'd had a good day and we should head home, and damm if we didn't hook another tuna, the biggest of the day, weighed 62# and while fighting that we hooked a sailfish, which Mark Warzecha, from Florida caught and released and we caught the tuna as well to end a great day! 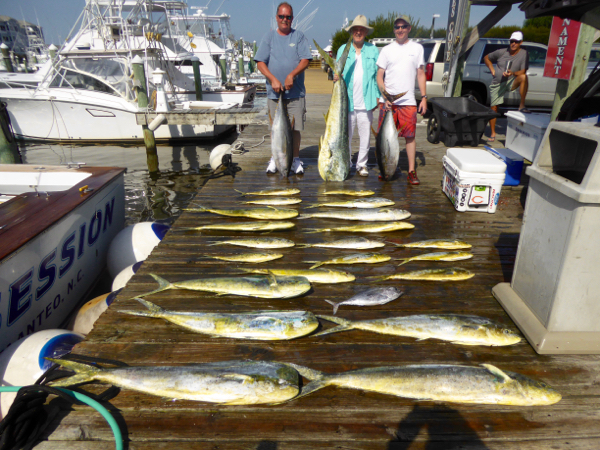 Fishing don't get much better than what we had yesterday, especially for the middle of July..... heading offshore to the tuna grounds, we found a change and stopped and immediately had school dolphin after us.... Jay Ashley & crew had steady action boating close to a limit of big school dolphin with a handful of gaffers mixed in..... we ran just a little ways further offshore and saw flying fish jumping everywhere trying to get away for big yellowfins..... set the kite out and had great action, boating 8 fish 50 - 60 #, while Brandon Owens, from Hampton, VA caught released his first sailfish, which we picked off a teaser and fought with the kite in the air.... 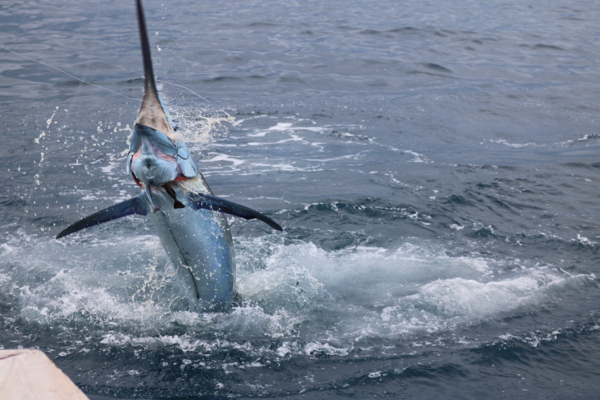 ACTION!! 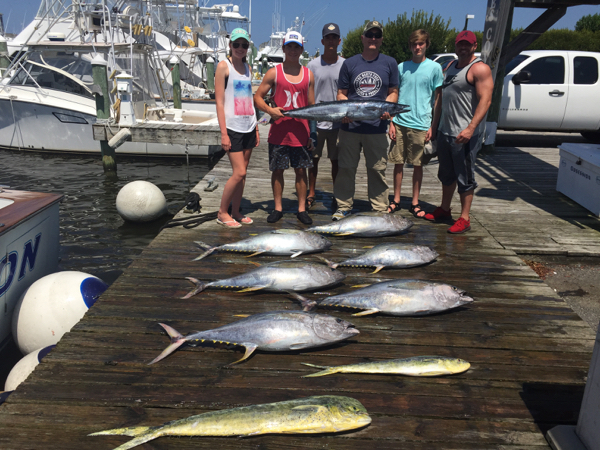 TORR HOWELL & CREW BOATED SOME LUNKER 50# YELLOWFIN ON LIGHT STANDUP TACKLE TODAY! 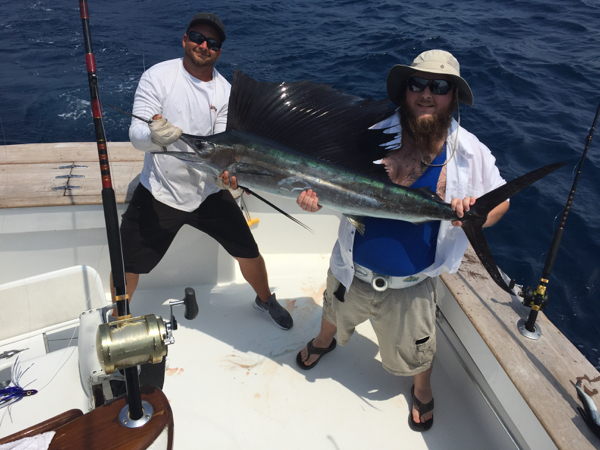 MICHAEL ODELL AND CREW WANTED BIG FISH AND A MARLIN..... 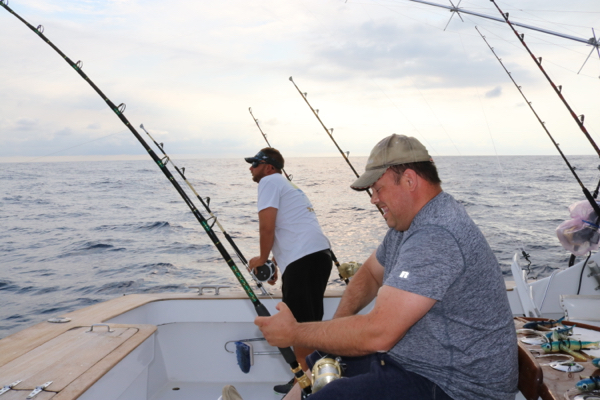 THE GUYS BOATED A NICE CATCH OF 45# YELLOWFIN AND 12-18# GAFFERS, BUT WE HAD A BLUE MARLIN ON BUT IT DID SOME FRANTIC WINDSHEILD WIPERING AND THREW THE HOOK #$@%#$!!! 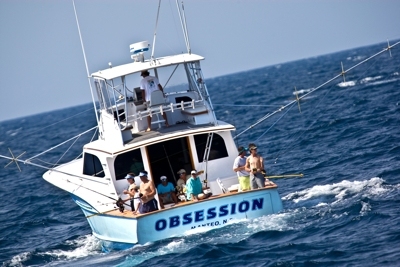 SOME GREAT PHOTOS PROVIDED TO ME BY BROCCO GRAHAM OF THE 250# BLUE MARLIN THAT THADD GRAHAM, FROM COLLINSVILLE, OK RELEASED A FEW DAYS AGO ON THE OBSESSION! 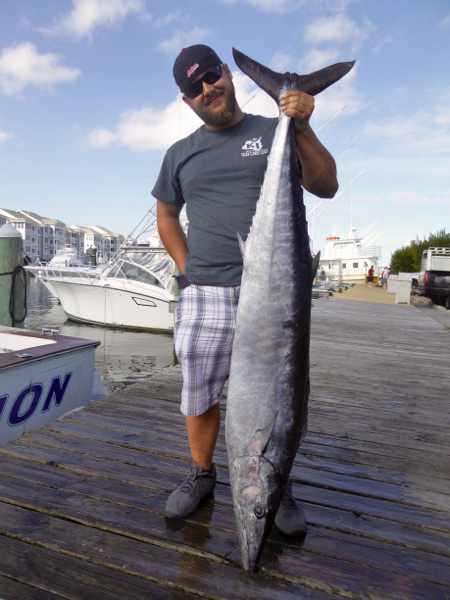 AARON GREER, FROM BRIDGWATER, VA. 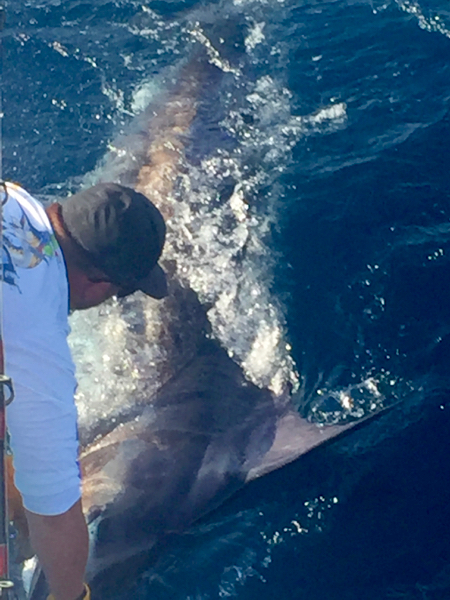 RELEASED A 300+LB BLUE MARLIN AFTER A 30 MINUTE BATTLE ON HIS FIRST OFFSHORE FISHING TRIP..... DID A GREAT JOB ANGLING! 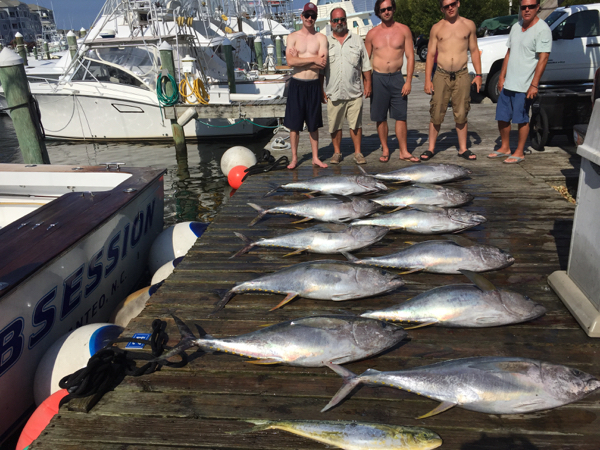 RICHARD WALLACE AND CREW BOATED AN NICE CATCH OF 40-50# YELLOWFIN TUNA ON LIGHT STANDUP TACKLE! 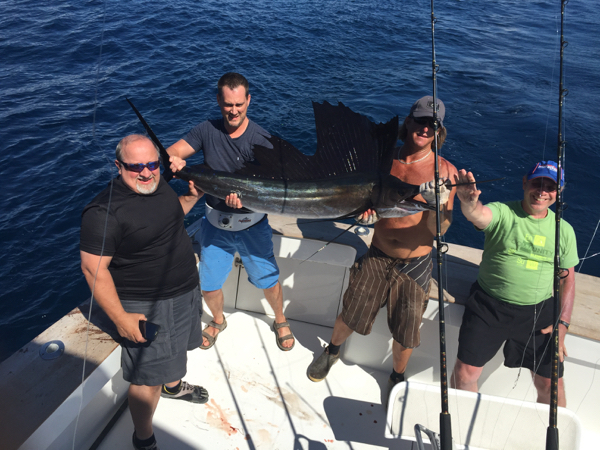 RICHARD FAUST AND HIS CREW FROM GEORGIA BOATED A NICE CATCH OF 30-50# YELLOWFIN TUNA AND SMALL BLACKFIN TUNA AND BENJAMIN PECK RELEASED HIS FIRST SAILFISH! 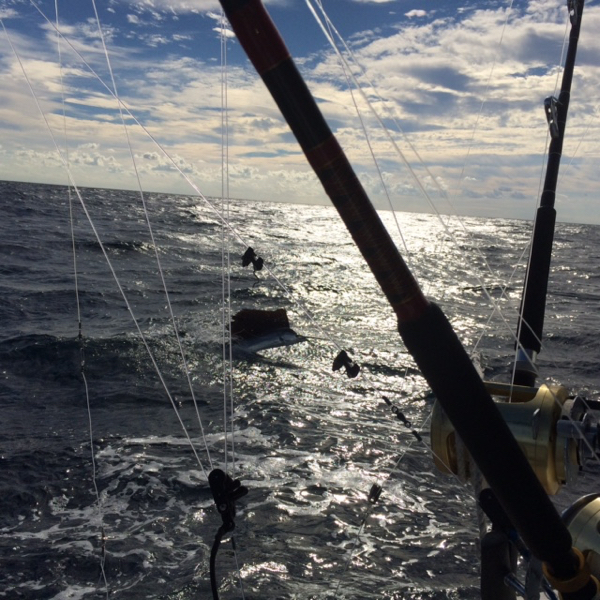 NICE DAY ON THE WATER! 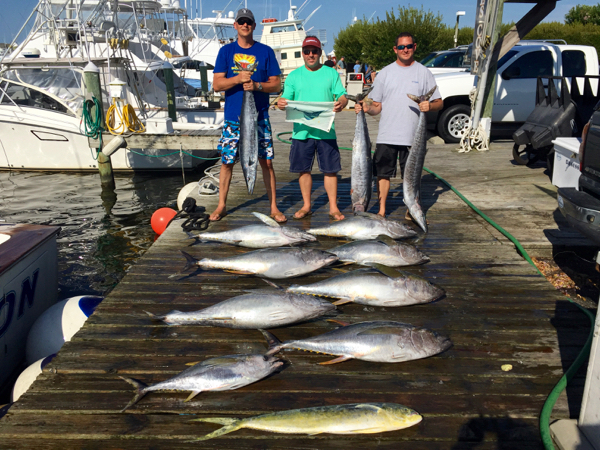 JOHN MERRELL & CREW FROM MARYLAND BOATED A MEATFISH GRANDSLAM TODAY, INCLUDING 40-55# YELLOWFIN TUNA, 5-14# MAHI MAHI AND A 25# WAHOO! 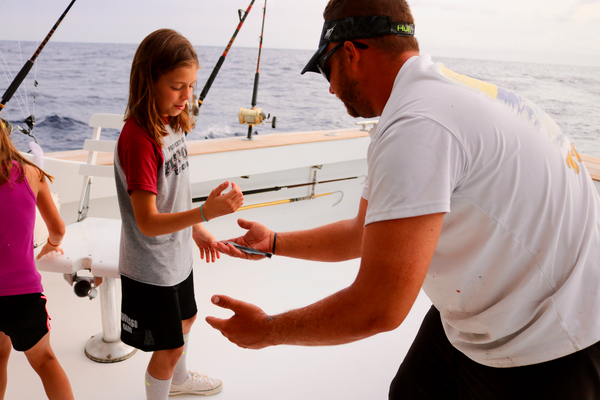 WE HAD A GUEST DECKHAND TODAY, A PROBABLY TOMORROW AS WELL... 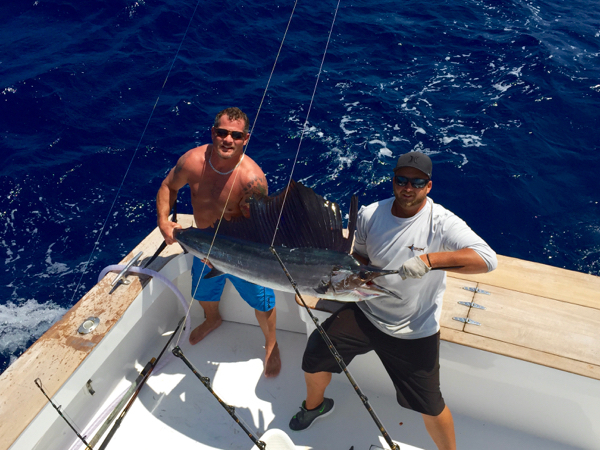 THE ONE AND ONLY ROBERTO, FROM ISLA MUJERES, COUSIN TO MY MATE OF MANY YEARS DOWN THERE CHAMY PEREZ VELAZQUES. 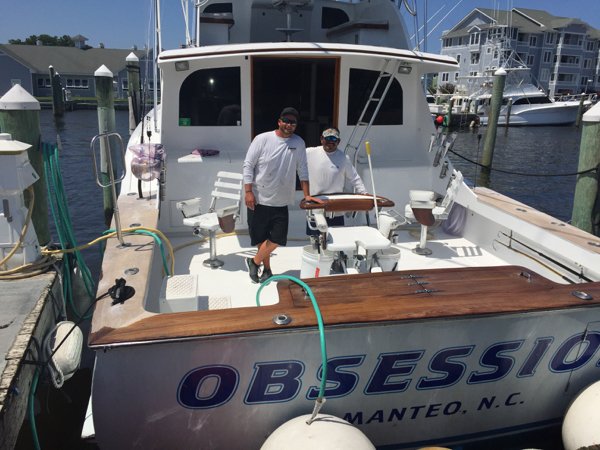 ROBERTO IS WORKING ON A BIG JOHN BAYLISS BOAT THESE DAYS AND IS ONE OF THE FINEST MATES AROUND. GREAT HAVING HIM ABOARD!! 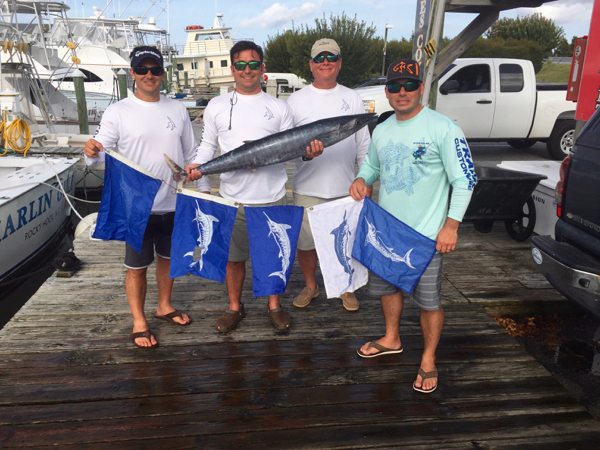 THADD GRAHAM, FROM OKLAHOMA, RELEASED A 200 LB BLUE MARLIN AND A SAILFISH, AND BROTHER BRACCO GRAHAM, FROM MANASSAS, VA RELEASED A SAILFISH. 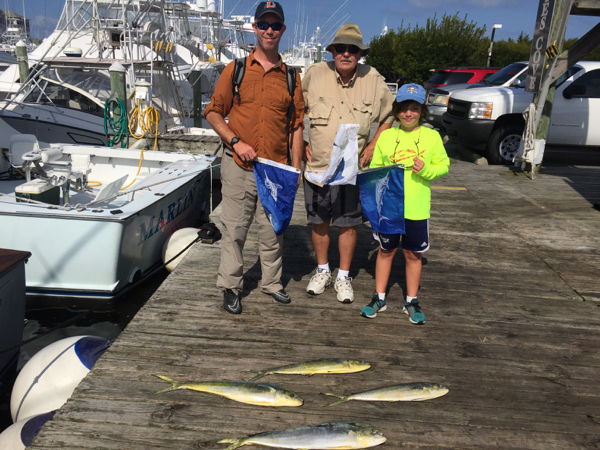 RUDY MIDDLETON & CREW HAVE FISHED WITH ME FOR MANY YEARS, BUT TODAY WAS THE FIRST TIME THEY CAUGHT YELLOWFIN ON THE KITE, WITH FISH 45-55# ON STANDUP TACKLE! 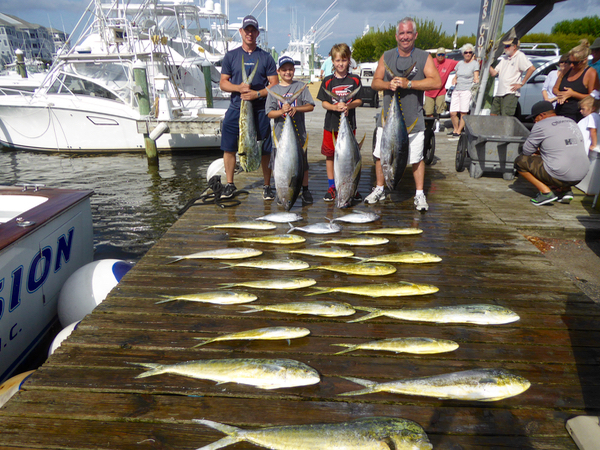 YOUNG'UNS HAVE A GREAT FIRST DAY ON THE OCEAN! 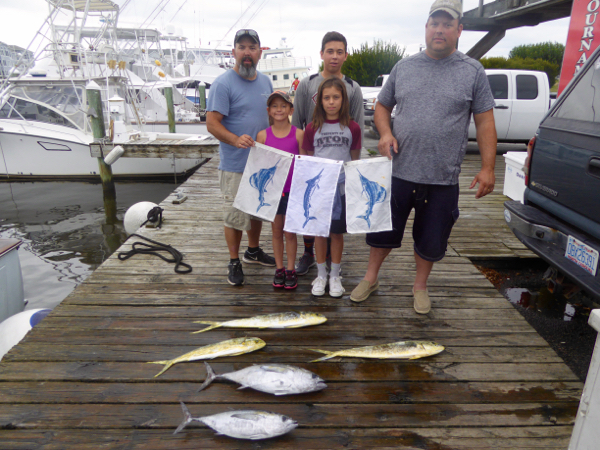 Tra Storey, brought his friends and some of their kids, all from North Carolina, for their first offshore fishing trip and they did great..... they all boated some nice dolphin from 3 -15 lbs, Tra's daughter twelve year old Grace boated a 50# yellowfin and twelve year old Owen Byers caught and released a sailfish and they, together with 12 year old David Byers all caught most of the dolphin . 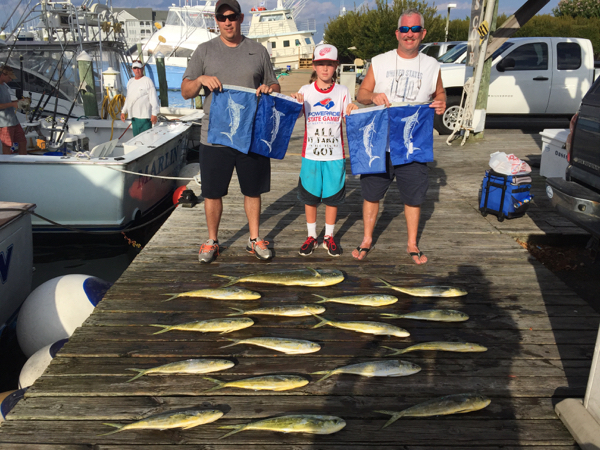 Eleven year old Logan Marley, son of Dave, boated a 50# yellowfin unassisted as did his young friend, and the whole group boated a bunch of dolphin on light tackle to start the day, and then some tuna kite fishing in the afternoon. 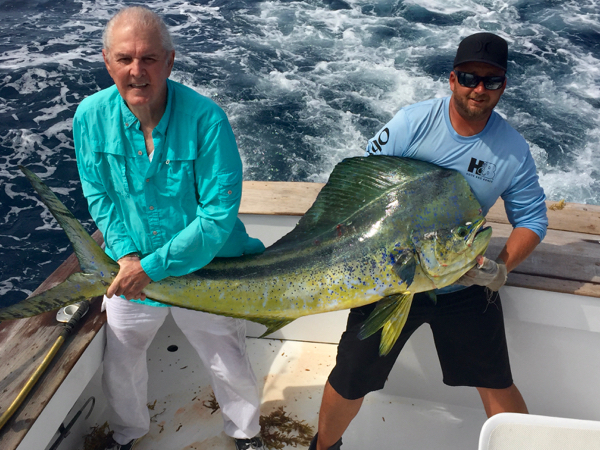 Steve Everett, who has fished with me several times in the last few years, boated the tied for largest dolphin ever on the OBSESSION, a 57# lunker, after a grueling 40 minute battle. 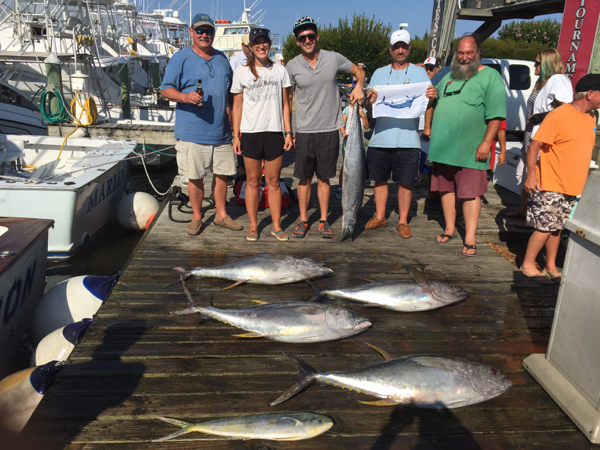 In the pouring rain, he and his crew caught most of a nice catch of big dolphin and a pair of 40# yellowfins along a weed line in a hectic two hour span of cockpit chaos! 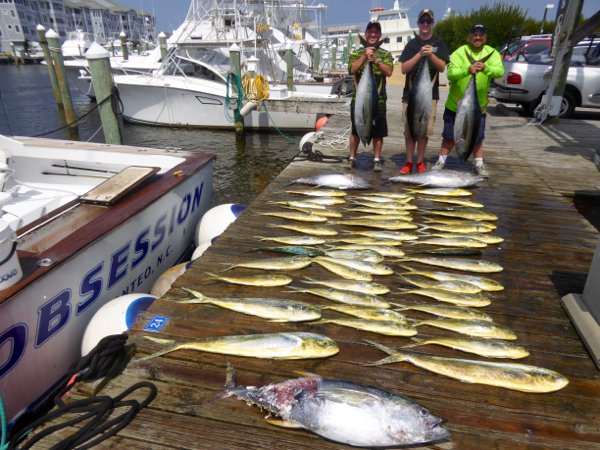 Regular customer and fellow "dead head" Bob Marley, from Winston Salem and his crew boated nice catch of dolphin along a weed line to start the day and then 4 nice yellowfin on standup tackle in the afternoon. 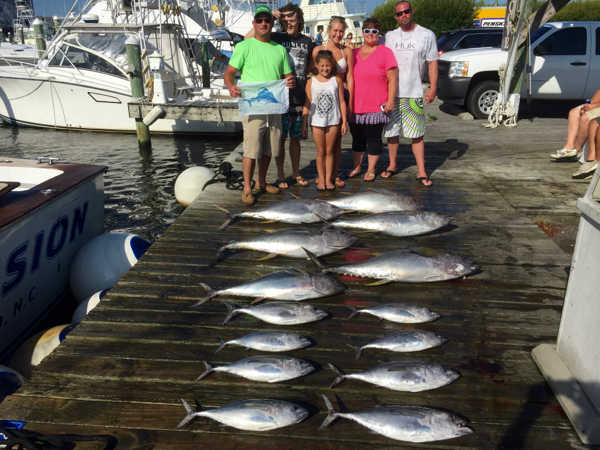 Roy Wilson, wife & daughter from Millner, GA fished with us today and caught all they could handle.... they had several double headers of yellowfin, including fish 35-50#, several mahi up to 15# and to end the day, Roy Wilson caught his first wahoo ever, and on of the biggest on the Obsession for several years, earning Roy a citation for a 77# lunker wahoo. 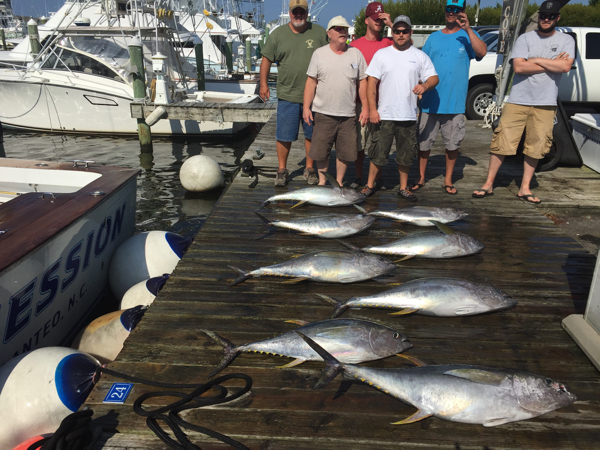 Tony Journigan & crew were with me the day we broke down a month ago.....yesterday was a better day, with no mechanical problems and great tuna fishing....picked away at them all day, and by one had the boxful of 35-50# class yellowfin. 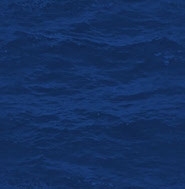 ONE DAY ITS GOING TO BE CALM! 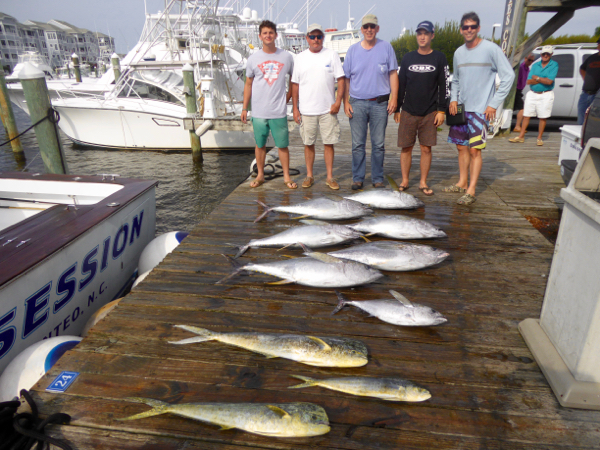 Glad these guys had been there before....Bernie Baron & crew have fished with me a long time so it was just another choppy day for them.... we started south of the fleet, found a change but no grass and very few dolphin....they did boat a few nice ones, but we missed a decent tuna bite first thing, but managed to pick out a few in the couse of the day.